MACHH / KARACHI: Authorities in Mach Jail hanged convicted target killer Saulat Mirza early Tuesday morning. The body later arrived in Karachi through PK 363. Emotional scenes were witnessed at the cargo terminal of the Jinnah International Airport where Saulat’s body arrived. His weeping sisters showered rose petals on the body. “No one was able to save him” one of them said. The body was taken to Edhi Morgue for final rites and then later to his home. According to reports, funeral prayers will be held at Maghrib and he will be buried next to his mother at Mohammad Shah graveyard. 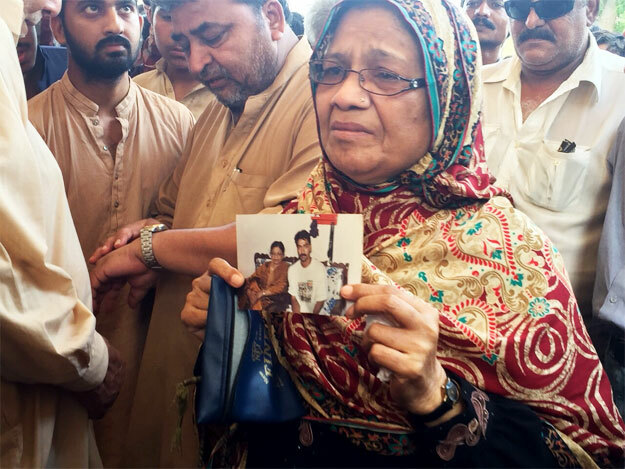 Saulat’s wife is with the body in the ambulance outside their home in Gulshan-e-Mehmar. While talking to The Express Tribune, Saulat’s wife asked why the government had given them false hope when they had no intention of saving him. “Why did they stop the execution earlier if they weren’t going to save him,” she said. “Why did they give us hope? It seems that deals have won and workers have lost,” she added. Speaking to The Express Tribune, Saulat’s sister said that one of her brother’s last wishes was that his body not be photographed or filmed by the media. Despite his family’s requests to keep the media away, some news channels managed to get footage of the convict’s body. The hanging came a day after Prime Minister Nawaz Sharif made the final decision on the execution. Mirza, who was convicted of killing Karachi Electric Supply Company’s managing director Shahid Hamid, his guard and driver, in Karachi, had his execution deferred twice before. Prior to the execution, he was inspected by a doctor and given a clean bill of health. He was then led to the gallows and was hanged under the supervision of a magistrate. 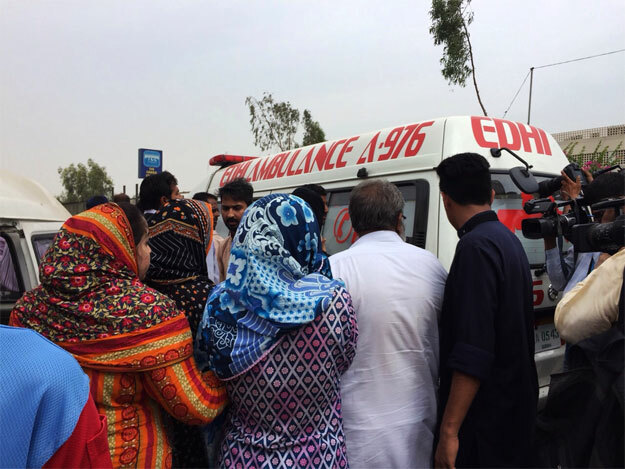 An ambulance was present at the jail to transfer his body to Karachi for burial. Meanwhile, Mirza was buried at the Shah Mohammad Shah graveyard in North Karachi. Earlier, his relatives, including his brothers and sisters, met with the death row prisoner. The execution was stayed on March 19 after he made startling revelations about Muttahida Qaumi Movement chief Altaf Hussain’s alleged involvement in the murder of KESC’s managing director. On March 30, Mirza’s execution was stayed for a further 30 days. The Sindh High Court on May 8 rejected a plea seeking delay in death row prisoner Mirza’s execution.